Two things I love about the summer: sequins and seashells. I’ve seen sequins pop up everywhere, especially J.Crew! Seashells are a part of my love for the beach, but I love a touch of them, either in a bracelet, necklace or printed across a gorgeous scarf. 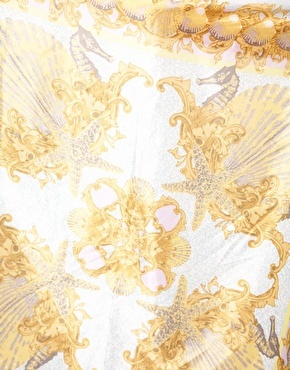 The mermaid trend was seen all throughout the SS ’12 runway shows, and I couldn’t be happier. These next few pieces would be a step in the way to achieving my own Ariel dream! 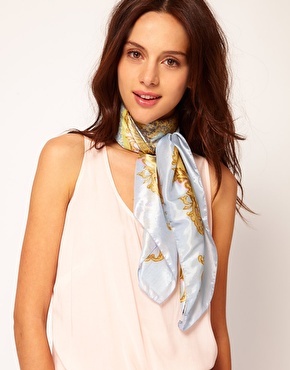 This scarf has the most amazing pattern, seahorses, shells, starfish, and on and on. I love the light blue mixed with gold and the affordable price. Thank you ASOS! I’d pair this as a belt around a white shirtdress with some fun gold wedges, or as a hair scarf with a white v-neck and some cuffed up boyfriend jeans. There were only sixty of these skirts made for J.Crew Collection, and I have a feeling I won’t be getting one of them 🙂 A bit expensive, but the detail of the pattern, the blue sequins and the fact that the skirt is pull on (a plus!) makes for a fun, but elegant summer skirt. I’d pair it with a white button down knotted at the waistband, tan leather gladiators and a messy ponytail. 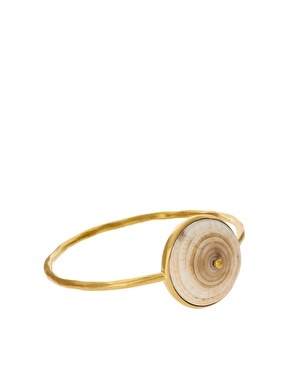 Simple, but still gorgeous I love this shell bracelet from Mirabelle, and it’s currently on sale at ASOS. The gold band itself is delicate and refined, but then there’s the shell which gives it a more outdoorsy feel. This J.Crew skirt is definitely out of my price range, but that doesn’t mean I can’t love it! The combination of colors (sea and sand), the silhouette, and the sequins all put this skirt on my favorites list.